Our surplus equipment auctions receive the same detailed attentions as any of our other auctions. We will evaluate your situation, and listen to your objectives. Our goal is to liquidate your property for the highest possible dollar. We will tailor our marketing to meet your needs. We will obtain other professional opinions when necessary, and make recommendations as to which auction method of sale is best for your situation in order to obtain the highest possible dollar for you on auction day. With all of our auctions we will accept cash, cashier's checks, company and personal checks with proper identification and business credentials. We can also arrange for wire transfer of buyer funds through our bank. We gladly accept Visa, MasterCard, Discover and American Express with proper identification and credit card verification. 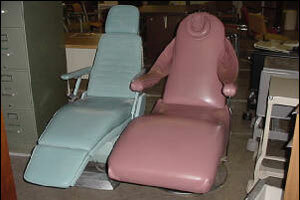 Dental chairs from the University are always a hit!